Veracity offers highly useful IP security and surveillance, transmission, storage, and power management products that help solve every day wireless network problems using innovative technologies in unique ways. Find power management solutions through battery powered hand-held PoE devices (POINTSOURCE), in addition to PoE and Coaxial cable extenders that provide longer cable deployments without loss (LONGSPAN). 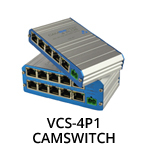 Focusing in three key areas: transmission, storage and display, their extensive product line also includes converters that turns any previously existing coaxial connection into a high-speed data and power network (HIGHWIRE), PoE switches designed for IP video installations (CAMSWITCH), large video storage devices that stay cool when handling multiple data transfers (COLDSTORE), and specialized WLAN accessories and power injectors that help deliver reliable remote power to external network devices (OUTSOURCE/OUTBREAK).